While Develop Don't Destroy Brooklyn (DDDB) maintained its presence yesterday at the annual Atlantic Antic, Brooklyn's biggest street festival, Forest City Ratner was conspicuous in its absence, with no new Atlantic Yards brochure to distribute. Given that the developer is hardly letting up on Atlantic Yards, I assume it's a temporary, strategic retreat, just as Atlantic Yards and FCR advertising were absent for this year's edition of the Community Newspaper Group's Brooklyn Tomorrow. They don't need to win over the locals right now. If Atlantic Yards proceeds, expect a big presence at subsequent Atlantic Antics. 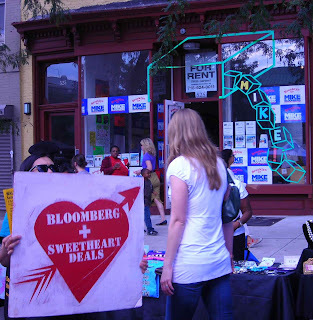 A couple of representatives of DDDB were even on hand outside a campaign office for Mayor Mike Bloomberg's reelection to remind passers-by of his professed love for sweetheart deals. Bloomberg's campaign had a strong presence at the festival. The campaign for Comptroller Bill Thompson, the Democratic candidate, also had a table--and, like Bloomberg's campaign, volunteers circulating through the crowd--but not as prominent a presence. 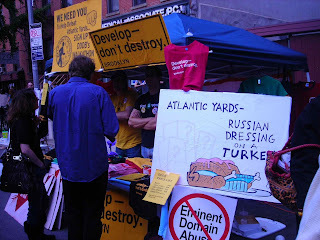 And Thompson, unwilling to criticize Bloomberg on Atlantic Yards, certainly was not endorsing DDDB's picketing. One lingering visitor at DDDB's booth was Steve Levin, the winner of the Democratic primary in the 33rd Council District and almost certainly the next Council Member, replacing David Yassky. Despite the economic downturn, some major construction in the area remains in progress, so, though the volume was certainly lower than in previous years, there were still attempts to promote new developments. 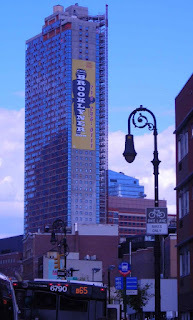 The 51-story Brooklyner, now the borough's tallest building, was easily visible from its 111 Lawrence Street base. It's a product of the Clarett Group, which no longer controls the Forte condo in Fort Greene, which has been returned to its lender after slow sales. 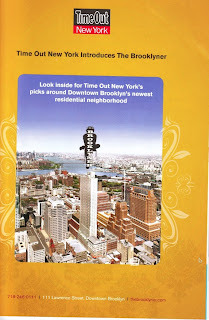 Marketers for the building distributed an edition of this week's Time Out New York magazine, wrapped with a new cover introducing The Brooklyner. As for "Time Out New York's picks around Downtown Brooklyn's newest residential neighborhood," consider that the insert sent readers as far south to the restaurant Alma on Columbia Street, well over a mile away, or the restaurant No. 7, about a mile away. There's more and more going on in Downtown Brooklyn--and that location really is Downtown Brooklyn--but the amenities that high-end renters apparently want are not nearby, not in FCR's MetroTech, but in the surrounding, lower-rise neighborhoods. 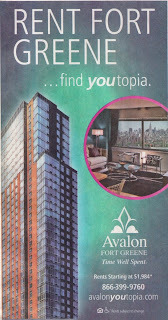 Anyone picking up a copy of The Brooklyn Paper saw the newspaper wrapped with an advertisement for Avalon Fort Greene, promoted via the dubious URL of avalonyoutopia.com. For those inspired by the excitement and opportunity of everyday life, welcome to youtopia. More than a lifestyle, Avalon Fort Greene offers the perfect backdrop for you to be you. It's a community with every resource you desire and a neighborhood with a positively eclectic vibe. Locally, do what you like. From shopping at Trader Joe's, to lunch in DUMBO, to an evening at BAM. Eat out, eat in, take out, and take in all that this neighborhood has to offer. The advertising, and the building's web site, manage to avoid the central fact of the Avalon's location: it's near busy, loud Flatbush Avenue and is just west of dozens of public housing towers in the Ingersoll, Whitman, and Farragut projects. 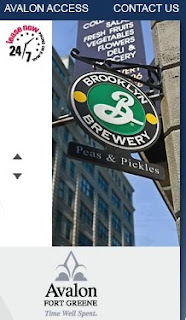 The grocery story Peas & Pickles may appeal to prospective residents, but it's in DUMBO, nearly a mile away. In fact, there's no nearby supermarket, as one on Myrtle Avenue was torn down for now-stalled development, causing enormous frustration and anger among public housing residents who no longer have a convenient place to shop for basic needs.